The trail was a wet, slippery slimy mess. Based at China Beach Campground we'd intended to day walk several sections but quickly learned that this kind of walking wasn't for us. Too much time spent working out how to stay upright and keep moving forwards, too little time spent looking up and around. 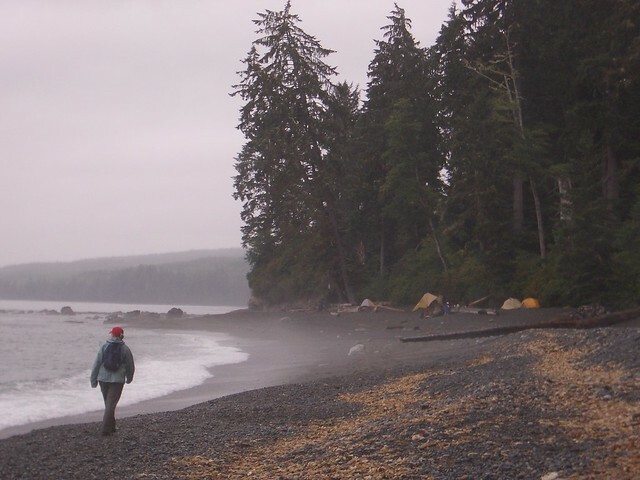 The Juan De Fuca Marine Trail was originally devised to save lives; to provide passage for sailors stranded on this wild coast with it's impenetrable forest. The line between survival and oblivion is apparently a fine one. The beaches were at the other end of the scale. Stepping out onto the black pebbles was a moment of pure magic. A magic concocted from a mix of ocean, forest, low hanging mist and silvered driftwood. Something for all the senses. Adding to the magic was the knowledge that the water to our left is home to Orca and Sea Otter and the forest to our right to black bear, wolf and cougar. Something for the imagination to boot. I'd never experienced anything like this place. Is there anywhere else like this place? Somewhere along the line I'd got hung up on the idea that the way to experience a landscape was to move through it. Perhaps it's a kind of greed? So little time, move along and get some more! On this day I learned that it sometimes makes more sense to sit still and let the landscape come to you. Realising the beach was where we wanted to be we gave up on the walking, set up a tarp against the rain and just sat down. We passed the day reading, brewing up and soaking up what we'd really come to see. It's easy to think of landscape as something static but stay put for half a day and each time you look up you'll see the view reframed. The movement of cloud, the change of light, the dilation of shadow each contributing to a complete re-rendering of the image. Landscape is anything but static. The highlight of our day at Sombrio beach came early in the evening when a family of sea Otter came to play in the surf in front of our temporary home. This simple image is far from technically perfect. Taken with a tiny compact camera it was never going to be. Cast your eye in the corners and you'll see the distortion. Look harder and you'll see fringing. It doesn't matter to me it's still an image I keep going back to simply because it captures something of the magic that place on that day. Perhaps you had to be there to appreciate it? I do love Canada. I can see how all the elements came together to create a rather special moment and the photograph, flawed as it is, only enhances that. I have plenty of images from cameras past that are technically poor, but emotionally great (to me at least). I like it. I've really got a thing for beach hiking, maybe it's spending most of my life living within walking distance of the long beaches of southern England and the South West Coastal Path. I should go back to it some day. You say it just right Maz. I'll take emotionally great over technicaly poor just about every time. Of course images with both are always going to come out top. Joe, Yeah. The coast seems to be in my blood to. The Western coast of Vancouver Island is dripping in atmosphere and is very special. The rain forrest is also a magical landscape but I learned I prefer to look at it than walk through it. The best combination of all though has to be coast with mountains. Beautiful spot, Sombrio. Spent a soggy night camping there during a thru-hike of the JdF a few years ago. Good entertainment with the local surfers honing their skills most days. Joe, Thanks for stopping by and taking teh time to comment. Yes, some days it's sitting still is the right thing to do and the coats, especialy that coast, is entertaining enough to fill up a few days. Jason, Soggy sounds about right. Hats off to the fact that you stuck it out and went the distance. We decided it was better to look at the rain forrest than to walk through it but perhaps more effort is required to aquire the taste. Our time on that coast closely followed a few days in the open high meadows of the coastal mountains on the mainland. We may have been better switching the order.